The Imo State Governor, Rochas Okorocha Thursday disclosed that two serving governor’s from the Southeast will be formally joining the All Progressives Congress (APC). 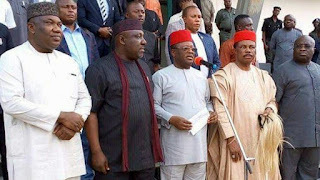 Okorocha who did not disclose the identity of the governors, stated that there is an agreement among the Southeast governors to move in one direction. According to him, “the insinuation that Southeast governors from other political parties will work for President Muhammadu Buhari for President and work for their candidates in the governorship election is not acceptable, you are either a member of the APC or not”. He continued that, “you will agree with me that Ndigbo played a dangerous politics in 2015 but we must correct that in 2019”.